A new report from the National Association of Home Builders shows the costs of constructing a single-family home were much higher when compared to 2011, reaching $246,553 last year compared with just $184,125 in 2011. Much of this cost was due to an increase in the price of lumber, as framing and trusses account for a considerable percentage of the construction costs. Between April 2011 and April 2013 the cost of purchasing softwood lumber increased by 40%. The survey that was conducted in August and September last year shows that even though constructing costs are rising, as are house sizes, the lot sizes are shrinking. The survey showed the average single-family home had 2607 ft.² of finished area and was built on a 14,359 ft.² lot, and sold for $399,532. This is an increase of 25% compared to 2011 when the average price for a single-family home was $310,619 but is still well below peak prices reached in 2007 when the average single family home sold for $454,906. The average lot size last year was about a third of an acre, but it has declined from approximately 21,879 ft.² in 2009, and 20,614 ft.² in 2011. Over the past few years, lots have been harder for builders to purchase. In August last year, 59% of builders regarded the availability of lots in their local markets as being low or very low. This figure has increased from 43% recorded in September 2012. It is likely that the low supply is driving up the costs of purchasing lots. In 2009 lot costs were $3.5 per square foot, declining to $3.3 per square foot in 2011, but increasing to $5.2 per square foot in 2013. The average construction costs accounted for 59% of the homes sales price in 2009 and 2011. This percentage had increased to 62% last year. The second largest share of the sales price is taken up by finished lot costs. These costs dropped last year to 19% compared to 22% in 2011. On average, the builder’s profits accounted for 9.3% of the sales price. The construction costs for new single-family homes can be broken down into eight major sections. 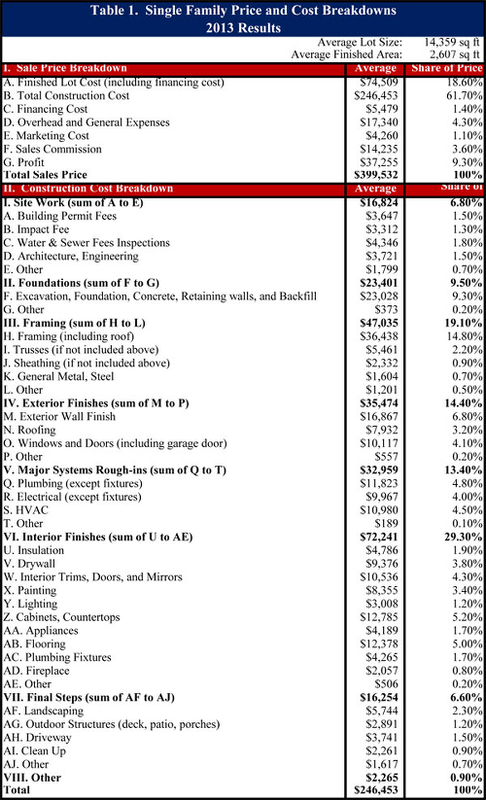 The costs of interior finishes account for 29.3% of costs, framing accounts for 19.1%, site work for 6.8%, foundations for 9.5%, exterior finishes for 14.4%, final steps for 6.6% and other costs for 0.9%. In addition to rising construction costs, many builders have to deal with labor shortages. Apparently framing crews are the least available, as 48% reported a lack of framing crews directly employed by their firm while 51% reported a shortage of subcontract framing crews. How to Lower Home Insurance Costs When Building a New Home The Cost of Home Building – Dreaming of Building a New Home, but Worried About the Expense? 12 Ways to Lower Your Home Insurance Costs: Who is Who in Ontario Home Building? Let’s demo it and build you a new house!